There was a time when Star Wars wasn’t exactly a mainstay in the world of video games. That may seem hard to believe now, but what few titles were published couldn’t quite figure out how to make use of the license. Sure, fans may have gotten some pleasure out of the polygonal confusion that was Star Wars Arcade, or maybe even convinced themselves that they liked the utterly forgettable Atari version of The Empire Strikes Back because of the Walker on the box art, but while clearly being set in a galaxy far, far away, none of these actually felt like Star Wars. After a couple of humdrum NES titles that saw Luke go from a cartoon to a stick figure, LucasArts finally decided to pitch in with the development duties and, along with Sculptured Software, created a trio of games for the Super Nintendo that finally demonstrated the power and potential of the of this beloved universe. With Mode 7! The controls are sluggish, the platforming is frustrating, the level design is uninspired to say the least, and Super Star Wars is still awesome. Or at least was. Look, maybe as a basic run-and-gunner it doesn’t quite reach, or even get close to, Contra III levels, but the music still evokes memories of the movie it’s based on, the digitized likenesses of Han Solo and Luke Skywalker bring the mostly static cutscenes alive, and all the favorite sound effects, from the electronic hum of the lilac-ish lightsaber to the “squeegee!” death cry of every Jawa slaughtered along the way are spot on. Playing this game now can be somewhat of an exercise in patience (there’s a special place in hell for whoever programmed the jumping), but those who change the difficulty level to easy and input one of the many helpful codes pretty much required in order to finish this (there’s no save or password function built in- be warned!) will understand why this game was so loved when it released in 1992. The vehicle segments are still a blast, with landspeeder assaults, fighting TIEs with the guns of the Millennium Falcon, and an X-wing in the middle of a Death Star trench run, and of course if you get sick of running around with Luke and his unwieldy weapon “for a more civilized time”, Han Solo and his trusty blaster become available later on. Just be sure to shoot Greedo first, though. And every single other thing that moves too. Super Star Wars was a breakthrough, and though the endless womprats and mouse droids could get annoying (especially to my colleagues on the podcast), the blueprint was finally in place for how to make a decent movie-based video game, and no list of the best Star Wars games would be complete without it. Better looking and better playing- that’s all we ask of sequels, right? 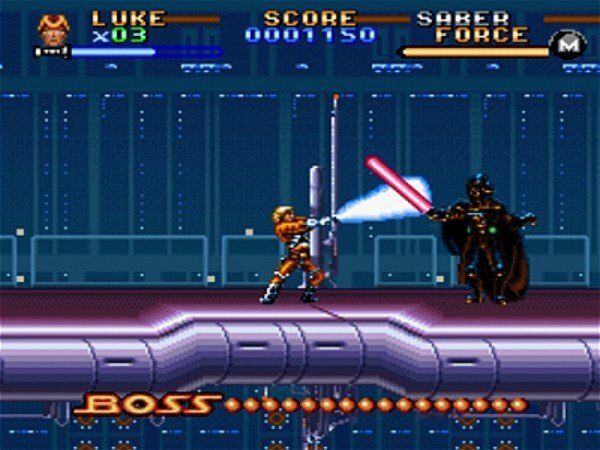 Super Empire Strikes Back took the formula established by its predecessor and refined it into something much richer, cementing the series as among the best on the SNES. The list of improvements is lengthy: more lightsaber controls, a lightsaber that’s the right color, more Mode 7 vehicle action, tauntaun riding, more playable characters, force powers, and a double jump, my god, a double jump, are among just some of the elements that make this game such a better experience. Super Empire Strikes Back also stays continually fresh throughout, due to the variety of environments and set pieces taken from the movie. All the big moments are here: The Battle of Hoth has your snowspeeder skimming over the surface, taking down probe droids and AT-ATs; Luke fights every swamp monster on Dagobah as he trains in the ways of the Jedi (that sort of happened, right? ), Han blasts his way through snow troopers to escape from the Rebel base, Leah shoots mynocks to her heart’s content, and in Cloud City Chewbacca spins around like a ballet dancer, punching out Ugnaughts left and right before destroying Slave I. Look, they had to make a game here, people. Anyway, the game looks 16-bit gorgeous, and once again the assets that make up the ambience of Star Wars are just as good, if not better here. Little touches like the breath of Luke’s tauntaun or Darth Vader’s gurgly “Impressive” as you spin jump the debris he throws at Luke go a long way toward immersion into the universe. Yes, Super Empire Strikes Back is hard. That’s why everyone who played it back on the SNES knew the 99 Lives code by heart (as I explained to the NXpress crew again). Cheat, or cheat not; there is no try. That’s how I’ve enjoyed the best game in the series to this very day, and so should you. After pretty much perfecting the side-scrolling Star Wars game with Super Empire Strikes Back, the developers apparently decided to follow the arc of the movies and make the last entry the weakest. Or for the weak, anyway! 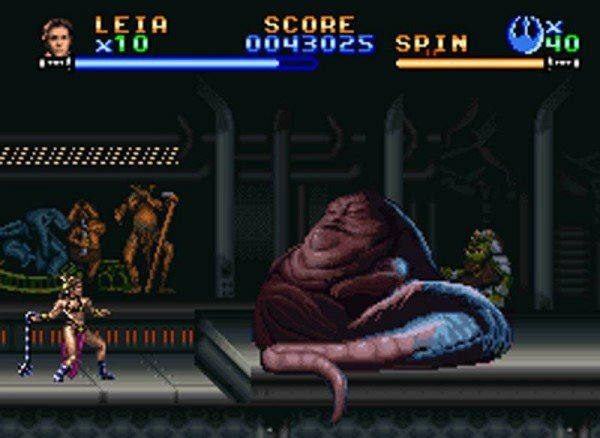 Super Return of the Jedi keeps the gameplay refinements and adds a few wrinkles of its own, like using the lightsaber like a force-draining boomerang, but it plays it mostly safe and so much easier, resulting in an entry that feels like it just wants to get things over with, maybe a tad under-inspired like its namesake. That’s not to say it’s terrible or anything; in fact it might even play the best of all the games, but when I try to think of a standout moment, nothing comes to mind. But while Super Return of the Jedi may go through the motions a bit, it still packs all the production value of its prequels, offering large, sprawling stages with lush visuals, even more character selection (for those who dreamed of fighting as metal bikini Leia), and the chance to shoot Salacious Crumb in the face over and over again. The Mode 7 speeder bike stage is infuriating, but hey, when have they ever gotten that right? And if you can avoid rampant cursing during the final Death Star run, you’re a better player than I. But still, these imperfections fit perfectly in portraying the source material, and that’s what adaptations are all about. 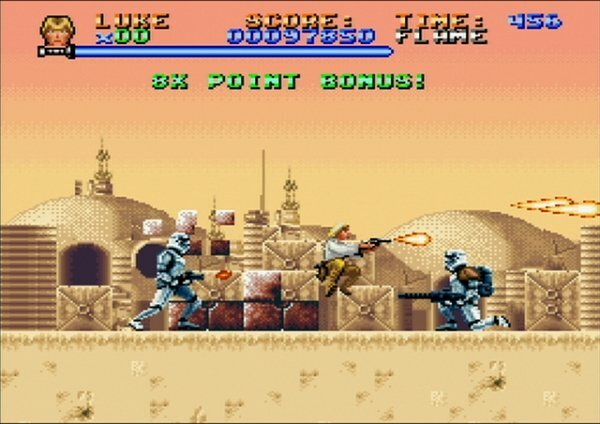 Super Return of the Jedi is the easiest game in the series, so easy that an expert player can probably beat it without using any codes. Imagine that! But it is still fun to play for the rest of us, and ranks as an SNES classic.